Here is a recipe that is very simple, but very handy. And really, it tastes much better that what you can buy in a supermarket. 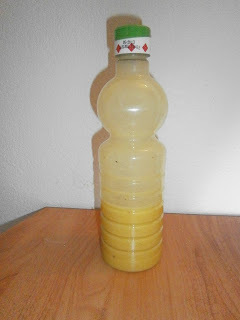 Some people will prefer when it is stronger, with more or less mustard... or with different kinds of oils or vinegars, some people use several kinds of oils (for example, olive and sunflower). You will need a shaker or a bottle that closes. In a bowl, pour 5 g of salt and some pepper. Dissolve it in 5 soup spoons of vinegar. Then add a teaspoon of mustard and stir well. Pour in the shaker and add 10-12 soup spoons of oil (I use olive oil). Shake well and it is ready. You can also replace the mustard with some shallots and garlic.